Originally released in 2013, Warframe is in a way a spiritual predecessor to Destiny (2014) as far as gameplay is concerned. 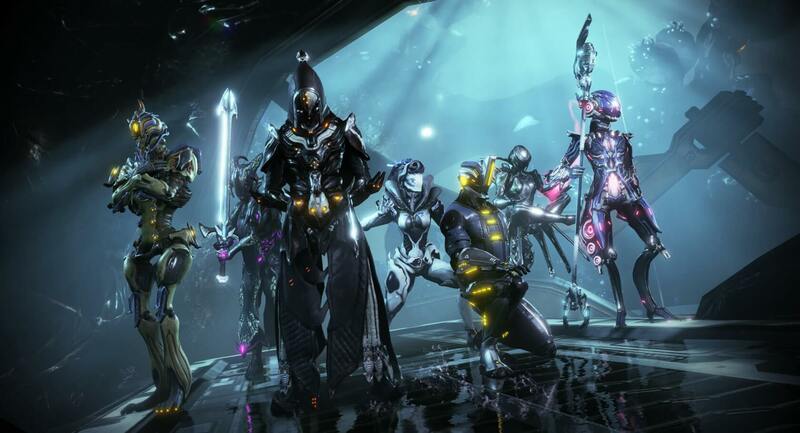 Up to four players team up to do battle in mechanical suits called "Warframes." Players fight against computer-controlled factions in PvE battles across the solar system. Console and PC versions have the option of player-versus-player matches, but it is unclear if the Switch version will feature a PvP mode since it is a bit more processor intensive. Digital Extremes and Panic Button have been quiet regarding the details of the port, but we can at least expect it to resemble the console variants to a fair degree. With a built-in audience of 30 million players (as of October 2017), the game should not have any trouble moving units at the cost of $0. However, players may be disappointed to find that they will not be able to take their existing Frames on the go. Crossplay will not be supported on the Switch version of the game, but this is probably for the best considering the fracas caused by the Switch/PS4 Fortnite fiasco. Even still, starting from scratch to play for free on the portable device is still pretty appealing. The developers are planning to support the game as aggressively as they do the console and PC versions with frequent updates and seasonal overhauls. However, they do not yet have a launch window slated, so we’ll just have to wait until they get closer to completion. Even still, starting from scratch to play for free on the portable device is still pretty appealing. I can insta-tell that you have not played Warframe. It is appealing but there is so much farming needed for anything that anyone that has put any effort on their progression path will not want to start over. EDIT: Also, although it can definitely be played for free a little bit of money can and will go a long way. It's one of the best F2P models with micro transactions I've seen. Actually, I did play it for a short time, but had a hard time getting into it. It seemed fun until I found myself endlessly dying (probably due to my lack of a willingness to farm as you say). I will probably give it another whirl on the Switch if for no other reason than to see how it looks. I am always willing to try "free" stuff. Find someone who can help you ease into the games mechanics, it's always better to join a newbie-friendly clan. It has a really steep curve of learning but is really enjoyable, even the farming. It's one of those games I get into for weeks or months and then drop it for a couple months and dive into again. I will definitely have to try it out again then. I'm not opposed to games with steep curves, but yeah I need to get in with some players willing to help me out. When I first played the folks I was with were more or less just leaving me behind. So it was discouraging.